The Beaver, despite its cute poster and the presence of kids in the audience is not a cute and cuddly experience. The moving story of a man completely consumed by alcoholism and depression is not for the faint of heart. The film places you immediately and wholly in the midst of Walter Black’s (Mel Gibson) deep, dark and all consuming reality. For those who have experienced depression or love someone who has suffered the reality of the portrayal their family situation will ring very familiar and true. For those who have not, Gibson’s acting will seem cumbersome and sensationalized and is probably the reason for the slapstick-like humor injected into his initial stumblings. The pain experienced by Walter, unfulfilled by family, career or any aspect of life, is palpable. Detached from his wife, rejected by his elder son and unable to communicate with his younger son, Walter seems an island floating alone in a vast vast sea. His toy company nears bankruptcy and he is disconnected from those who work for him. This film seems to be all about perceived shortcomings and loss, for each character seems to have something to mourn. The wife (Foster) mourns the loss of her husband as the son (Yelchin) both mourns being fatherless and fears each day he will become just like him to the point that he keeps a sticky note checklist of the similarities they share so that he will recognize them when they arise within him and be able to put them down when they rear their heads in his life and his mirror. The apple might not fall too far from the tree it seems. After a failed suicide attempt and several solo drunken days, he happens upon a beaver puppet in a dumpster. 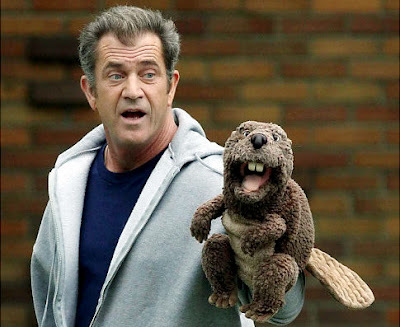 As a CEO of a toy manufacturing company, he decides to use the beaver to speak for him the words his mentally ill self cannot express and all around him are asked to “address the beaver”. Through the beaver, Walter begins to become reacquainted with himself as do those around him. He is able to reconnect with his younger son first, followed by his wife who tolerates the beaver for awhile but eventually and naturally want only her husband back. The beaver is everywhere Walter goes, speaking all that he wants to say to co workers, family and strangers. When Walter decides to make the beaver into a new and eventually very successful “gotta have it” toy for the holidays, we are not sure if it is by chance or a well thought out marketing ploy but we cheer him on nonetheless. The lost Walter has regained his voice, the respect of his company and we see remnants of a charming personality and loving family man. The elder son is forming a relationship with a cheerleader (Lawrence), a nice one at that, who has a buried loss of her own and they discover each other through that shared connection. We all know how the story must end; that Walter must reclaim his own life and separate himself once and for all from the beaver and it is that struggle that provides the real meat of the film. And the separation is difficult one to watch. Gibson’s portrayal is a very human one and rivetingly played out. In times it seems a mirror image of his own life struggles of late; exposure, loss of restraint, poor judgment and redemption. I had hoped to again see the actor I had come to love over the years and I was not disappointed. Why Kyle Killen’s script seem whiny, juvenile and immature at times, in the end we realize that these are real people, illustrating what many people struggle with each and every day. It is a stark portrayal of what families often have to go through to hang onto their families and loved ones in the all consuming grip of depression. This is not a romp through the daisy field but in the end we are left with a degree of hope that something will rise from the flames. This is what life is about. Loss and dealing with loss.